A fairly large two-storeyed house, built between 1625 and 1629. A fragment, consisting of a short length of wall and the S.E. quoin of a destroyed building, standing I ft. 6 ins. from the N.W. corner of the existing building, is probably part of an earlier house. The present house seems to have been an entirely new building as is implied in Owen WYIlll’S letter to his father of 25 August, 1625: ‘Sir William Jones is gone to Castellmarch to lay the foundation stone for the new house.’2 Inscriptions in the house suggest that this work was completed by 1629. Despite internal alterations, the main elevation retains its original form. 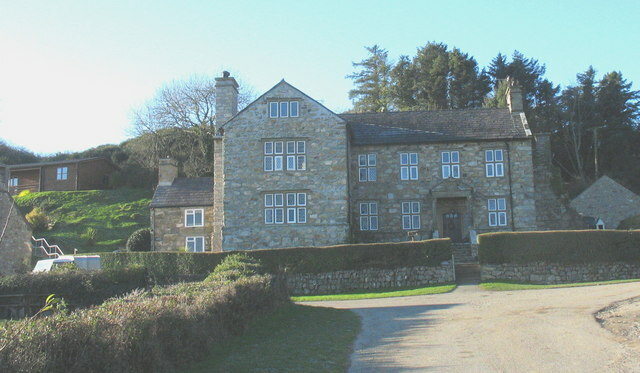 The house consists of a main block facing E. with a projecting wing at the S. and later additions to the S. and W. The facade is unbalanced, the position of the doorway is unusual, and the plinth is not returned at the N. end, but apart from these features there is no indication either of provision for an extension, or of connection to an earlier building now destroyed, and the N .E. quoin is well-formed. This hypothetical building 3 could explain the asymmetry, but there is no other reason to postulate its existence and it is difficult to see how it could have been related to the surviving fragment of early wall, which is set at an angle to the main alignment of the 17th-century house. 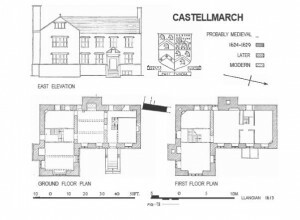 Structural and documentary evidence are both opposed to the suggestion 4 that the house was adapted from a Tudor open hall with solar wing at the S. and a destroyed service wing at the N. The interior has been much altered and repaired; many of the partitions are probably later than the visit of Hyde Hall (ca. 1810), who described the house as in a ‘state of decay’s The walls are of roughly coursed rubble with freestone dressings. The stones are exposed on the E. and N. walls but elsewhere hidden by later plaster. The roof is covered with modern slates. 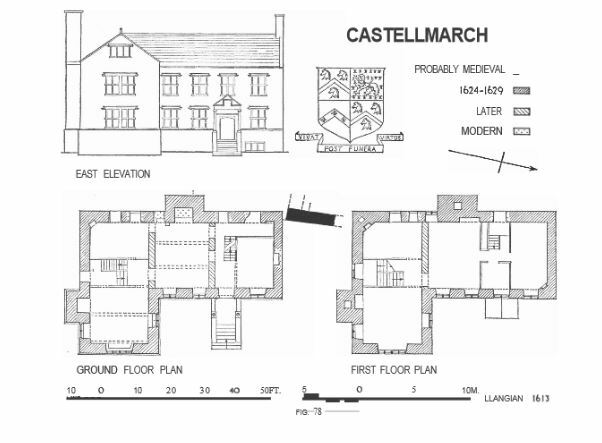 The main E. elevation (Plate 50) has two-light mullioned and transomed windows to both storeys, and a three-light mullioned window to the cellar. The E. end wall of the projecting wing has two four-light mullioned and transomed windows with a thick centre mullion and a three-light mullioned window in the gable. Two two-light mullioned and transomed windows on the N. side of the S. wing are now blocked. All the windows are ovolo-moulded. The main doorway has a depressed pointed arch and a cavetto-and-ogee moulding on the jambs. It is approached by a flight of stone steps leading to a pedimented porch carriedon Doric columns (Plates 51,60). On a frieze on the front and sides of the porch are shields of arms in relief, and in the pediment is another shield with the date 1628 beneath (Plate 60). The shields in the frieze from left to right are: S. side: (a) afl eagle displayed (Cilmin Troed-ddu), (b) Gruffydd ap Cynan, (c) a lion ramp-allt;6 Front: (d) Gruffydd ap Cynan, (e) a chevroll between 3 tzais heads erased (Meirion Goch), (f) a chevron between 3 dolphins hauriallt (Trahaearn Goch), (g) Hwfa ap Cynddelw; N. side: (h) indecipherable, (i) Collwyn ap Tangno, (j) Trahaearn Goch. The shield in the pediment is quarterly, 1 and 4, Meirion Goch for Jones of Castellmarch, 2, seme-de-lis a lion passallt 3, Oil a chevroll 3 fleurs-de-lis (Madoc ap Hendwr).7 The porch may have been rebuilt, since parts of the decoration on the side friezes are missing. An ogee-moulded plinth runs below the sills of the ground-floor windows and is returned down each side of the doorway. The eves course and the copings to the gable of the S. wing are hollow-chamfered; the latter have rounded kneelers and are surmounted by a small finial. The S side of the house has an entry behind a modern addition, but whether it was original or not is uncertain as its jambs are covered with plaster. There are two two-light mullioned and transomed windows, one to the stair landing partly blocked, and the other to the first floor with the mullions completely encased in plaster. There is a large projecting chimney stack. The plinth is returned on this side. The W. side has a number of early openings, some blocked. One on the first floor, a two-light mullioned and transomed window next to the large projecting chinmey, has only recently been exposed. The N. end is gabled with hollow-chamfered coping and has a rebuilt chinmey. Inside, the house has been considerably modernised and little of the original plan can be recovered. The much damaged dog-leg stair in the S. wing is probably in situ (Plate 54), as may also be the partitions on each side of it containing door-ways with shaped heads. The stone partition between the S. wing and the N. block is perhaps secondary as it overlaps the recently exposed W. window on the first floor and a similar opening, probably originally a window, on the ground floor; it may, however, replace a wooden partition. The stone partition to the N., the post-and-panel partition, and the adjacent stair, are all secondary; the stair runs across a shaped door-head in the wooden partition. There are two large stop- chamfered beams over the S. room in the N. block spanning between the stone partitions and presumably re-set. That on the W. has slots for a partition which would be unusual in this position. The stair in the S. wing is in two flights. It has solid treads and a moulded grip-type handrail. There are square-moulded balusters to the upper flight, and tall moulded newel posts reaching from floor to ceiling. The cupboard under the stair is formed of re-set early panelling which has a frieze of semi-circular foliations. The window-seat in the E. room of the S. wing bears the same decoration. The staircase in the N. block is a medley of earlier fragments, including square-moulded balusters from a 17th-century stair, but not apparently from the stair in the S. wing, since the profiles differ. On the first floor, on the S. wall of the S .E. room of the S. wing and on the W. wall of the S. room of the N. block, are early stone fireplaces, with ovolo-moulded jambs, tongued stops, and ogee-moulded vermantles. Over the fireplace in the S.W. corner of the S. wing is a relief in plaster comprising an arch with the date 1629 at the top, supported by pilasters between which is a shield of arms:quarterly, 1 and 4, Meirion Goch for Jones of Castellmarch, 2, seme-de-lis a lioll passant guardant, 3, Madoc ap Hendwr; crest, a nag’s head erased; motto, vivat post funera virtus (Plate 60). Over the fireplace in the N.E. corner of the N. room is a similar shield, bearing Meirion Goch, with a pilaster on each side and A NOD N I 1628 above (Plate 60). The crest and two of the nag’s heads on the shield have been destroyed, but their outlines are visible. The roof over the main block is inaccessible; that over the S. wing is modern. There are cellars under both parts of the house, but they contain no early features apart from a three light mullioned window on the E front. REF 1: The name presumably derives from an earthwork. The nearest known is No. 1578 in Llanbedrog parish, a little over a mile to the N.N.E., but a MS. of 1871 (Arch. Camb., 1903, p. 253) mentions ‘a circular British camp in the saudhills on the farm of Castellmarch’. 1 Wynn Papers, No. 1364; if. No. 644, dated 1614, and Dwnn, 11, p. 117, visitation dated 1596, as evidence for the previous house. Sir William .Tones (1566-1640) was Chief Justice to the King’s Bench in Ireland, 1617-20, Judge of the King’s Bench of England, 1624-40. His son Griffith Jones was kidnapped by a landing party from a Royalist frigate while he was at Castellmarch, and the house was plundered; see Cal.S.P. Dom., 1649-50. For both see Griffith Ped., p. 191; A. H. Dodd. Studies in Stuart Wales (Cardiff, 1952), pp. 83. 130, 159, 173. 3 Suggested by Harold Hughes, Arch. Camb., 1926, p. 462. In Arch. Camb., 195 6 p. 159. 5 Hyde Hall, p. 291. 6 For Rhys ap Tewdwr, the indented border omitted, if. tablet to Margaret, wife of William Jones of Castellmarch, 1609, at Beaumaris Church, Anglesey ltw., p. 6b; this and the other shields denote his or his ancestors’ marriages. 7 By comparison with his first wife’s tablet, see preceding n., the second quartering should stand for his second wife, tlee Powis, of Abington, see Griffith, Ped., p. 191.Neither here nor elsewhere in the house do the arms of Meirion Goch with chevron agree with those which in 1596 were recorded here by Dwnn, n, p. 117, without chevron; J. Y. W. Lloyd, History of Powys Fadog, VI, pp. 22-3.